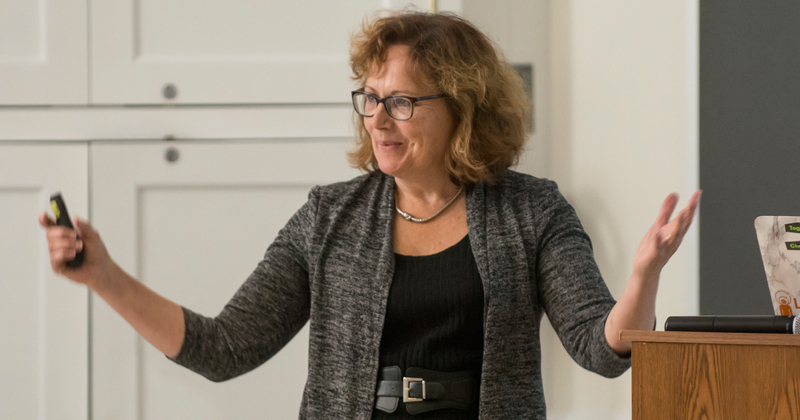 Lori Pollock, Alumni Distinguished Professor of Computer and Information Sciences at the University of Delaware, has received an Undergraduate Research Mentoring Award from the National Center for Women & Information Technology. She was presented with the award on May 16, 2018. “The NCWIT Undergraduate Research Mentoring (URM) Award recognizes Academic Alliance representatives at non-profit, U.S. institutions (excluding U.S. territories) for their outstanding mentorship, high-quality research opportunities, recruitment of women and minority students, and efforts to encourage and advance undergraduates in computing-related fields,” the organization said in a news release. The Academic Alliance is group of more than 1,700 representatives from more than 500 colleges and universities. Pollock will use the $5,000 award to support five undergraduate students in computer science who plan to participate in the computer science study abroad program in New Zealand during winter 2019. Sara Sprenkle, an associate professor of computer science at Washington and Lee University, was an undergraduate student at Gettysburg College when she was paired with Pollock as a mentor through the CRA-W, Committee on the Status of Women in Computing Research, Distributed Research Experiences for Undergraduates (DREU) Program in 1998. Pollock joined the UD faculty in 1991. She does research in software engineering and computer science education. She is also an advocate for broadening participation in computer science at every level, including K-12. She is leading efforts that focus on professional development for computer science teachers, broadening access to computer science education, and incorporating computational thinking throughout the undergraduate curriculum.